At last month’s Bristol Town Council meeting, East Bay Citizens For Peace (EBCP) asked the town to sponsor an event to discuss the impact of military spending on our communities and pass a resolution to call on the federal government to reduce such spending and instead fund local needs. Shockingly, all five members, including Kenny Marshall, who stated publicly that he would pass the resolution when asked (by me) at a debate prior to the November elections, denied EBCP’s request! It was a moment I won’t forget anytime soon, because it was then when I realized that many local leaders know and/or care very little about the larger issues. They confine themselves solely to the world of local politics, no matter how much regional and national politics shape the crises we face. 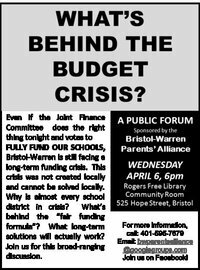 For example, the Joint Finance Committee (JFC) is allowing Bristol-Warren schools to be boxed in by the state, which is cutting aid to the district by more than $8 million over the next ten years. Rather than fully funding the school department’s request of $2.9 million to simply maintain the same services it currently provides — and giving all the stakeholders (i.e. students, parents, teachers, adminstrators, and concerned citizens) a full year to organize and direct their angst at the people most responsible for this mess (i.e. state and federal officials) — the JFC is forking over only a little more than half of the amount. Hartford, CT City Council Votes to Bring Our War Dollars Home Now! Unbridled war spending by the federal government and President Obama has drained resources from our communities to keep the wheels of the war machine grinding on. This has also translated into attacks on education and unions, especially in the public sector, as states scramble to make up for budget shortfalls. Recognizing that the majority of Americans are against the wars and occupations in Iraq and Afghanistan, 17 groups and individuals with a focus on peace and justice joined together to bring forward a resolution to the city council of Hartford, CT. It said, Bring Our War Dollars Home Now! Money for Education, Jobs, Housing and Healthcare! With this historic vote Hartford is the first state capitol to pass such a resolution and joins city councils in Portland, Maine and Northampton, MA in saying not another penny for wars and occupations. Be it resolved that the city council of Hartford call upon the US government and President Obama to end the wars and occupations in Iraq and Afghanistan and bring our war dollars home now. Be it further resolved, that the city council of Hartford urge residents to participate in the April 9, 2011 national march in New York City to end the wars and occupations and bring our war dollars home. The following poem was inspired by the many students who spoke out at last night’s Joint Finance Committee meeting. May their optimism and open-mindedness carry on with them into adulthood… and reemerge in others who have lost those qualities. If kids could vote, they would not be ignored. If kids could vote, there would be an end to war. ﻿﻿﻿If kids could vote, no schools would need to close. If kids could vote, all would be fed, sheltered and clothed. If kids could vote, we would live in a better place. If kids could vote, our future would be safe. You are currently browsing the Bristol Bull Raker blog archives for March, 2011.